Stand Replacement Fire and Its Effect on Birds /Hawks Aloft Inc.
We all have watched in dismay as the Las Conchas fire has incinerated some 156,000 acres of our beloved Jemez Mountains, destroying homes and livelihoods of those unfortunate to live within the boundaries of the largest wildfire in the history of New Mexico. I’m not sure which was worse, watching the giant plume of smoke tower into what appeared to be cumulus clouds or coughing and hacking as the thick, viscous smoke settled into the canyon during the night obscuring all distance vision during the morning. Although the fire certainly traumatized many humans, no human life was lost. What effect will this fire have on the wildlife that called the Jemez Mountains home? Deer, elk, bobcat and bear sightings have increased in communities as animals were driven from their habitat. Concern has been raised about the Jemez Mountain salamander, a candidate species for federal listing, and the Mexican Spotted Owl, a federally threatened species listed, in part, due to the threat to its populations from catastrophic wildfire. Many species of birds found in the coniferous mountain forests of the southwest, particularly those inhabiting ponderosa pine forests, evolved in a habitat that historically experienced recurrent low to moderate severity fires about once a decade. Beginning in the last century, grazing of surface fuels by introduced livestock, clear-cut logging, and widespread fire suppression has greatly reduced the frequency of surface fires in these forests. The change in fire frequency has altered forest composition from a formerly park-like habitat with open canopy and a grassy understory to dense thickets of young trees with many downed branches. This altered environment has resulted in larger and more intense fires. 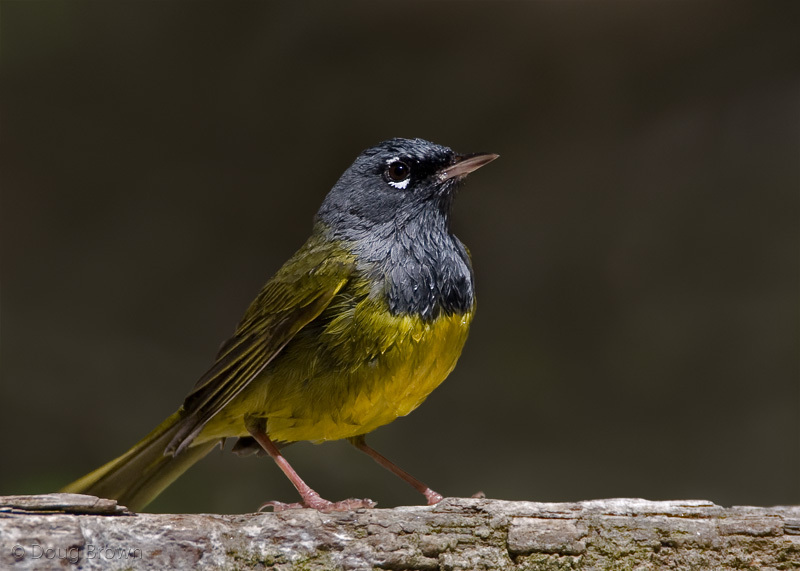 The immediate effect of fire during the spring and summer breeding season is the loss of the reproduction for most species of birds. Although parents forced to abandon their nests can escape the flames, unflighted young are hopelessly trapped. There also is additional pressure on adults that must resettle into an unfamiliar area that almost certainly is already inhabited by other animals that rely on that habitat for food, thus increasing foraging pressure for all. In May 2000, the Scott Able Fire burned 16,000 acres of coniferous forest in the Lincoln National Forest, south of Cloudcroft, New Mexico, affecting 9 known nesting territories for Mexican Spotted Owl (MSOW). Portions of the forest were completely scorched leaving only standing dead trees, while other areas burned in a patchwork pattern. Hawks Aloft conducted a four-year study of the 9 known Mexican Spotted Owl territories and conducted a complete inventory of the burn and surrounding buffer zone in 2005 to document owl activity in addition to the nine known territories. During year one of our study, we detected no nesting activity for MSOW. However, each year as the vegetation underwent successional growth, owls and other birds re-occupied the canyons. 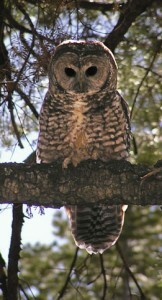 Over the course of the study, we found Mexican Spotted Owls in 8 of 9 survey sites. Although owls were rarely observed in burned areas, we often found them in unburned areas adjacent to burned habitat. Based on our results, it appears that the fire shifted Spotted Owl territories, and that some owls were using burned areas for nocturnal foraging, while breeding in adjacent unburned habitat. We also conducted avian surveys at a series of points within the burned area and at control points that were not affected by that fire. The results of this four year study demonstrate how some avian groups responded positively to successional habitat created by fire, while other avian groups responded negatively. Most species were documented using burned habitat, and some species were found almost exclusively in burned habitat. House Wrens, Violet-green Swallows, Western Bluebirds and Green-tailed Towhees were the most commonly recorded species in burned habitat. 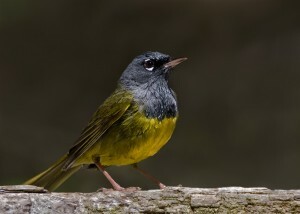 Species using scrub vegetation, such as Green-tailed Towhee and MacGillivray’s Warbler showed a steady increase throughout the study that likely continued for many years following its completion. We also found some surprises, such as the discovery of a nesting population of Purple Martins that were utilizing the standing snags. This led to a two-year study of the martins nesting in a previously unknown region and at the highest elevation reported for the species. Some birds, like Three-toed Woodpeckers, were associated with numerous snags, undoubtedly benefiting from an increased availability of insects or nesting cavities. Our three studies associated with the Scott Able Fire demonstrated the importance of snags, and post-fire management should consider the effects of snag removal on birds. All snags might not be of equal value to birds. Snags in close proximity to unburned habitat, rather than in isolated patches, might provide better conditions for cavity nesting species. There is much to learn by studying the effect of catastrophic fire on birds, particularly on the relative value of different snag sizes and densities to different groups of birds, especially species of conservation concern. Although the Scott Able fire was an intense crown fire, it was still only 10% as large as the Las Conchas fire. Our studies found that many bird species either tolerated or benefited from the habitat modification. We observed most species at least once in burned habitat, and several priority and management indicator species regularly used burned habitat. We do not discount the importance of wildfire prevention, especially when human lives and property are threatened; however, our observations revealed some benefits of such a fire. Because many species use, and even depend on, burned habitat, managers should consider wildfires to be of some long-term benefit to the avian community. For further reading, copies of all three reports are available on the Hawks Aloft, under the Conservation tab/Publications. By Gail Garber, Executive Director, Hawks Aloft, Inc.